The menopause has been thoroughly medicalized in Western culture and this process has determined the way we now think of, respond to, and feel about it. We have to look to its medical history to understand why this natural phenomenon has become sodden with a cultural negativity which is ill-founded and spurious. 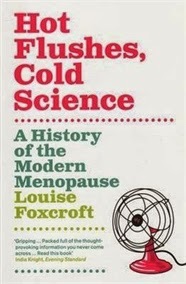 The above is exactly what Louise Foxcroft goes on to do in Hot Flushes, Cold Science: A History of the Modern Menopause: she traces the history of the menopause for the past two thousand years, from the Ancient World to the emergence of modern medicine in the 18th century to hormone replacement therapy and contemporary approaches. Foxcroft’s central thesis, which she supports with plenty of evidence from historical sources, is that the loaded cultural meaning of the menopause doesn’t directly follow from its biological manifestations. Instead, it has its roots in deeply entrenched negative attitudes towards women and ageing. I wanted to read Hot Flushes, Cold Science because I thought it would make for an interesting companion to Florence Williams’ Breasts, which I really enjoyed when I read it earlier this year. The subtitle of the latter is “A Natural and Unnatural History”, in reference to Williams’ combination of science and cultural history; Foxcroft, on the other hand, leans much more heavily towards the cultural history side of things. Which is of course perfectly fine — I love books like this, which illuminate how the practise of science and medicine are affected by social factors, and which go on to show us how this process happens over time. I especially like them when they’re written by people who are careful not to throw away the baby with the bathwater and who acknowledge that the scientific method is a good way to make sense of the world — it’s just that its practice doesn’t take place in a vacuum. Louise Foxcroft doesn’t delve into this as deeply as, say, Cynthia Eagle Russett; but all the same, it’s very clear that this isn’t a “medicine is inherently corrupt” sort of book but rather a “the practice of medicine, like so much else in our world, is influenced by misogyny” one. One of the best ways to demonstrate that a phenomenon we think of as “natural” is in fact cultural is to trace its history over time. Foxcroft thus begins by showing us things haven’t always been this way. She tells us that “when the menopause [made] its debut as an official medical entity in the eighteenth century, the emphasis was on reassuring patients. But as the menopause was illuminated, it was pathologized.” Today we perceive the menopause as something close to a disease, requiring medical intervention and treatment. This process is not at all unlike the creation of “micromastia” (the “disease” of small breasts) described by Williams in Breasts: the creation of a pathology is (coincidence of coincidences) shortly followed by great efforts to market a cure. Foxcroft calls the sense of anxiety and dread women are encouraged to feel regarding menopause “a lucrative fear”, which seems to me a very apt way to phrase it. The all-inclusive lists of physical and psychological symptoms associated with menopause today may or may not include hot flushes, cold sweats, night sweats, weight gain, backache, tingling, fatigue, headache, palpitations, arthralgia, dizzy spells, irritability, nervousness, anxiety, apathy, depression, early wakening, emotional instability, fears, feelings of suffocation, forgetfulness, insomnia, lack of concentration, lightheadedness, loss of interest, loss of self-worth, feelings of panic, sadness, tenseness, osteoporosis, depression, dysuria, dyspareunia, parasthesia, chest pains, breast pains, constipation, diarrhoea, facial hair, vaginal dryness, changes in libido, in skin and hair, and, unsurprisingly in light of these lists, worry about the body. These myriad symptoms take in every bodily system – vasomotor, cardiovascular, metabolic, sensory, digestive, skeletal, glandular and the central nervous system – yet the only universally agreed symptom is vasomotor, the constriction of blood vessels which precipitates hot flushes. Of course, this isn’t to say that women who experience symptoms beyond hot flushes are “faking it” — only that “individual and cultural influences illustrate just how complex the relationship is between bodily changes and the plethora of symptoms women say they experience.” There’s no point in suggesting that women should expect all of the above when individual variations are so huge, and when there’s so little scientific evidence supporting a strong link between the menopause and most of the items on that long list of maladies. Our understanding of the menopause was developed in a cultural context where “women were solely understood by physicians as child bearers”: the belief that reproduction is the “purpose” of women’s lives, the idea that women are helpless victims of their biology, and negative attitudes towards older women all combine to form the perception of the menopause as the “end of viability, fertility, beauty, desirability and worth”. Today the justifications are different (“oestrogen deprivation” rather than “hysteroneurosis”), but the overarching narrative is the same. The good news is that none of this is inevitable: Foxcroft reminds us time and again that the meaning we attribute to the menopause can change. A world in which we see women as fully human, in which we understand sexuality in its full complexity, in which ageing and the loss of markers of conventional beauty aren’t widely portrayed as tragedies, in which we challenge the association between youth, beauty, desirability, and a fulfilling sexual life — this would very likely be a world in which the menopause wouldn’t inspire such widespread anxiety. They [the 18th century medical establishment] were creating a disease from a discomfort – a process which often involves stigmatization, and attitudes and assumptions about the menopause proliferated: ‘the malady of the women of forty’ was a phrase physicians used to describe the ‘traumatic’ experience of women who painfully realized that the male gaze might be directed at younger women, while they were left with ‘cold respect’ and ‘forced politeness’. This, they agreed, explained women’s ‘ill-natured, restless, and often agitated’ demeanour and the ‘terrible harm’ that ‘merciless time’ did. Some historians still understand women as historically passive and impotent, and – resurrecting Aristotelian notions of the perfect male body (as though biology doesn’t affect men and their bodies) and the much less than perfect female body – defective or deformed. And if we erroneously entertain the idea of women victimized by their own nature and as ‘direct victims of male sexuality’, where does that leave the actions and beliefs of society, of the medical profession, religion, politics and economics? It is difficult, if not impossible, to read authors such as Shorter without being forcibly struck by a not always subtle, but always present, misogyny. The shame, contempt and confusion that shrouded diseases peculiar to women were extremely hard to dislodge, rooted as they were in fundamental ideas about the very nature of things. Female sexuality was not understood as being independent from the male’s, revolving as it did around pregnancies, childbirth, nursing, family care and menopausal ‘anxieties’. Men’s sexuality was defined, in popular and medical literature, as instrumental, forceful and direct, whilst women’s was supposedly expressive and responsive, and medical discoveries were used to validate conventional ideas about femininity and women’s sexuality. That women were natural invalids was almost universally embraced and there was a pervasive belief, even amongst many women, that biology had incapacitated them. It has been powerfully argued that cliterodectomy was the surgical enforcement of an ideology which restricted female sexuality to reproduction. Instinctive and autonomous sexual pleasure, especially after the menopause, was seen as a precipitating cause or a symptom of insanity. Baker Brown was expelled from the Obstetric Society in 1867 after many complaints from patients who felt they had been tricked or coerced into surgery. His colleagues found it difficult to agree on the efficacy or the morality of the procedure, although some regretted its demise. Lawson Tait was almost wistful about its passing, saying, ‘I am certain in many cases it could be useful,’ and in America there were those who regretted only that Baker Brown’s enthusiasm had ‘prostituted an occasionally valuable and desirable operation’. In short, let me say this book sounds like a must-read for young women. Second, don't get me started . . . if I start to write, I'll go into a loooooooong rant. Either British people call hot flashes a different name than Americans do, or I have been calling them "hot flashes" in error for years. This sounds really interesting. You know how I love to read about cultural narratives. This sounds really interesting. Most of what I know about menopause comes from my mother who (like Debi says above) pretty much just wished it would happen already well before it had. I also love books with this sort of cultural history, so onto the wishlist it goes. The point about pathologizing menopause is really interesting. It makes me think of the so-called obesity crisis and the push to classify obesity itself as a disease, even in people who don't have any problems related to their weight. There's more money in treating it if it's a disease. Jenny, I don't know if it's a US/UK difference or if there are regional differences within the US, but they're hot flashes where I live too. I haven't read many books about menopause, but I also haven't found any I think I'd like. I wonder if it's a bit like Barbara Kingsolver said about the "terrible twos," that if you expect trouble, you get it (she said if we called them the "fat fours" then everybody would worry about four-year-olds gaining weight). Having been through menopause, I'm not convinced that even the hot flashes are inevitable. Especially in an age when one can go directly from taking birth control to no longer being fertile, I don't think anyone--and that definitely includes doctors--knows enough about it.